We all know that we should eat our five a day. That is, five appropriately sized portions of fruit and vegetables. They boost our vitamin and mineral intake and help with healthy gut function. Easy when it’s written down on paper, but not so easy when it’s a child that doesn’t like fruit. Oh no, Little Chap raves in detail about the glorious main courses and better still, the various “cakes” (read: various fruit and sponge puddings) he gets for afters! Thing is, it seems to be doing the trick, because in order to get to eat his crumbles, pies and puds, he seems to be wolfing down the main course first, which is more important to me. All the experts tell us that if a child doesn’t want to do something you tell them to, the easiest way to overcome their unwillingness, is to make it into a game. Make it fun. So you may be interested to read on about how to make fruit kebabs with them. This is a simple, inexpensive activity or “game” to play with your child that might just fill them with curiosity or tantalise their taste buds and help them on their way to a fabulous fruity five a day. 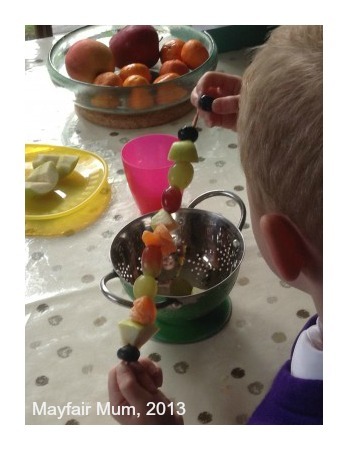 The other day Little Chap asked if he could make a fruit kebab. He’s been desperately sad that he can’t be in the Nursery again, now he is in Reception. Something which seems to have troubled him more since he had such a darned good time there and since he’s realised that his beloved nursery teachers now have a new crew of three year olds running rings around them on whom to dote in lieu of him and his now four year old buddies. 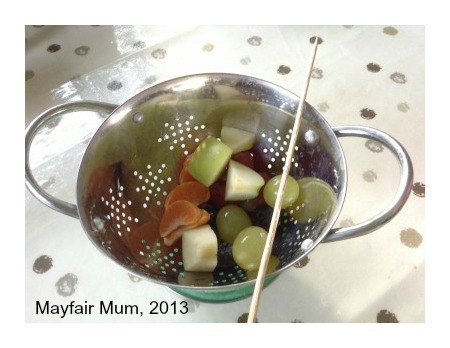 Making fruit kebabs was something his nursery teachers did with the boys one week, about this time last year. Their topic of the week was, not surprisingly Fruit (and yes, it was followed up by, you guessed it, Vegetables!). The teachers read Handa’s Surprise by Eileen Brown to the boys that week, a book whose amusing tale and beautiful bright images must have made some impression on Little Chap, as he pointed it out to me at the library quite some weeks later and he happily requested a range of his favourite fruits in his packed lunch from then on. He also liked to get quite cross with me once or twice when I didn’t have what he was thinking of in my fruit bowl that day…! So, as it was snack time when he asked me and I was thinking I had a few pieces of fresh fruit that needed eating, I agreed. He happily spent the next ten minutes or so choosing which grape, blueberry, apple chunk or satsuma segment to thread on to his skewer before he greedily pulled them right back off again and stuffed them into his mouth. Here’s how we did it. Protection for your child’s clothes. This will depend on their age. Little Chap managed to thread his skewer without getting any juice on his school uniform but to be fair, the fruit we used was not that juicy. You might want to put a bib or overalls on a younger child or just make do with a few baby wipes for sticky mouths and fingers after they’re done! Younger children may need a little help threading the fruit onto the stick. Although Little Chap (not quite five) needed no help second time around (I can’t speak for the first I’m afraid! ), he did encounter one or two blueberries and grapes that needed eating and replacing because they split on threading due to their size being a little too small. He soon learned that to achieve success, it was best to choose a larger chunk and thread it confidently through it’s middle. Asking him what he liked best about it, it was clear that the process gave him a sense of achievement and pride. He wanted to make some for us to try too. He said the best bit was eating the fruit but that threading them on to the skewer was also pretty cool. Do you have any tips for getting your child to eat five a day or try new fruits and vegetables? Do please leave a link to your post in a comment below. This entry was posted in Making & Baking, Parenting & Family and tagged eating habits, five a day, fruit, fruit kebabs, fruit puree, games, How to..., pre-school, school dinners by Mayfair Mum. Bookmark the permalink.